Despite being at the heart of the question of the emergence of the European Upper Palaeolithic, the Aurignacian osseous industry is essentially known by the production of split-based points, ornaments and portable art whereas bone tools, usually dedicated to domestic tasks and with variable technical complexity, have been largely ignored. However, when the high number of unworked tools is included – i.e. 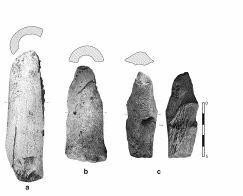 bone fragments recovered from food processing and used directly as tools with no previous shaping phase – bone tools represent a significant proportion of the Early Aurignacian industry. Among these unworked tools, is a newly-discovered type: “unworked intermediate tools.” This article presents a detailed description based on taphonomic, typological and technological characters. It shows that these tools are diaphyseal fragments which are used directly as a wedge, very likely for woodworking and perhaps for antler processing. The processes behind the appearance of osseous technology at the beginning of the Upper Palaeolithic in Europe are then discussed in light of this discovery and, more generally, the revised composition of the Early Aurignacian toolkit. The high proportion of unworked bone tools, a type more commonly associated with the Middle Palaeolithic, suggests a more gradual technological shift between Middle and Upper Palaeolithic than has previously been considered. As part of this hypothesis, the emergence of working osseous material could be due to a gradual transfer of techniques previously applied to wood, as others have proposed. 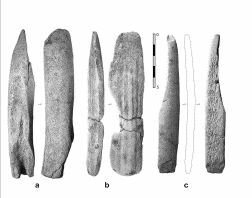 Examples of unworked intermediate bone tools from Early Aurignacian assemblages: a. Grotte des Hyènes, BE4-1307, unit 2C, b. Gatzarria, 6E  9, c. Gatzarria, 9C  15, layer cbci-cbf. Examples of other types of osseous intermediate tools from the Early Aurignacian. (a) on a section of antler beam (Gatzarria, 10C  13, layer cbci-cbf), (b) on elongated antler beam flake (Castanet, north sector, layer A), (c) on half rib (Castanet, north sector, layer A). Use-wear marks on unworked intermediate tools (Castanet, north sector, layer A). On the distal end, the artifact shows use-wear polish and crushing; on the proximal end, several flake removal scars. The artifact has also been used as a retoucher. ► Describes a new type of Aurignacian bone tools: unworked intermediate tools. ► These tools are food processing by-products used directly as wedges for woodworking. ► Expedient bone tools are very numerous in the Aurignacian osseous industry. ► This suggests a gradual technological shift between the Middle and Upper Palaeolithic. ► Osseous technology could be part of a transfer of techniques from wood working.